Home / Travel / Are All-Inclusive Resorts Worth It? If you’re looking to take a nice vacation in the the Caribbean or Mexico you will inevitably come across some all-inclusive resorts as an option for your accommodations. Are these pricier options a better deal than staying at a normal hotel and paying for your meals? Or are you better off separating the two expenses on your vacation? If you plan ahead and review all your options, you can lower your costs. Here are four tactics you can use to figure out if an all-inclusive resort is right for you and your vacation plans. An all-inclusive resort is a resort where you pay a premium over the average cost of a room at a resort and get free food and drink included. Instead of having to go out to restaurants and bars on your vacation you can have it all on one secure property. You pay a significantly higher price over the average room rate, but the perks can make it worth it. Are you there to relax and completely stay on the property? Or are you looking for an adventure that puts you deep within the local culture? The type of trip you are taking will determine whether or not an all-inclusive resort is best for you. If you are looking for the completely relaxed and pampered vacation where someone waits on you at a moment’s notice, then an all-inclusive can be a great option. On the other hand if you are looking to go out and explore a city, getting involved in the local culture, and trying out the hole-in-the-wall restaurants in the locale, then an all-inclusive won’t be the best value for you. You’ll have paid the premium for all the food and drink you want at the resort and spend extra money exploring on your own. Another factor to consider is just how high of a premium the resort is charging for the all-inclusive rate. Are you spending an extra $100 or $250 per night? The difference can make or break your interest in the resort. All it takes are some simple calculations to figure out how much you might spend per day in food and drink and if the premium is significantly above that it probably isn’t worth it. Then again if it is pretty close to what you would estimate you would spend on your own, the ability to have everything at your fingertips rather than a taxi ride away can make it worthwhile. The last thing you should consider before dropping extra money on all-inclusive perks is to read many reviews on the resort. Even if the pricing worked out to be pretty similar to what you thought you would spend eating out on your own the quality might not be the same. All-inclusive resorts are notorious for using well liquor instead of the premium stuff when they make your drinks. They might be cutting back on the quality of food as well.Â Reading many reviews will give you a better idea of the overall quality of the resort, but pay special attention to the food and drink reviews. Unhappy customers are more likely to write reviews online so don’t let one or two bad reviews turn you off. Hotel companies have paid people to put positive, fake reviews on websites in the past. You can’t guarantee you won’t be reading a fake review, but if the resort has hundreds of reviews and 95% of them are positive then you know you’re looking at a quality establishment. Spending an hour reading reviews is probably worth it before you drop several thousand dollars on a trip. Want to save some money? Try these inexpensive vacation options! What do you think? Are all-inclusive resorts worth it? 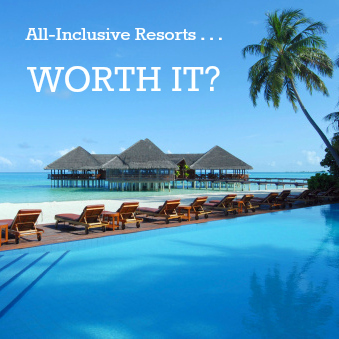 5 Responses to Are All-Inclusive Resorts Worth It? I haven’t tried these resorts yet, but from what people say, they seem to be worth the package deal. It certainly does depend on the type of vacation you are looking to take. For me, All Inclusive Resorts have won out in almost every case. The reason is that I am usually just looking for a winter getaway, somewhere hot with my wife. We usually only have a week and just want to relax, unwind and enjoy a beach. Because we only usually have a week and want to realx, the All Inclusive option allows us to just show up and not have to worry about anything. Drinks, Meals, Entertainment are all included and planned out for you. Not having to spend time thinking about meals or running around (possibly getting lost) looking for entertainment, allows us to enjoy the short time that we have to escape from our everyday stresses. If I were to plan a family vacation with the kids that was longer than a week or so, it would likely be a different story. If you plan on drinking they are. Other non-inclusive resorts have drink and food prices so high ($50 per person for a buffet, anyone?) that all-inclusives are a way to indulge yourself while on vacation. This post couldn’t come at a better time. I’ve been considering booking a vaca for the family and I’ve been debating all-inclusive vs. not. I’ve been reading a lot of reviews of the properties and they’re very helpful. Great post! All-inclusive resorts are not for me though I’ve stayed in a few over the years. They were ideal for my senior trip after high school because I was on a limited budget and wanted everything at my fingertips (and paid for!). My husband and I recently stayed at an all-inclusive resort in Mexico were unimpressed — the food was awful, the drinks were subpar and everything seemed to come with a catch.